From the drying grasses to the turning leaves, autumn's touch transforms nature all around us. Attracted to the vibrant hues of reds and yellows, many people focus on this beautiful scenery that falls with autumn. The new foliage trends seem to harvest much of the attention. 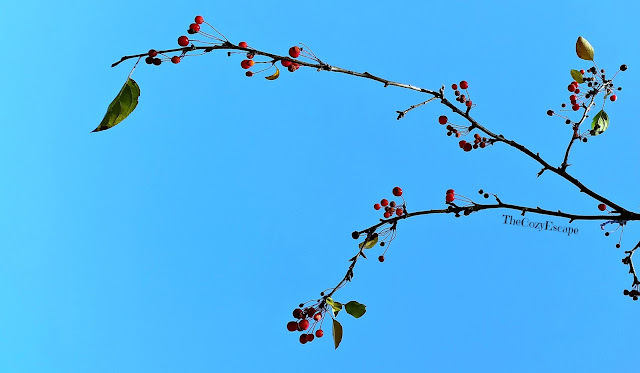 Although this branch is speckled with autumn berries, the late-summer leaf clinging to the tip emerges from the rest. Its contrast from the typical enchants the viewer, their eyes curiously captured by its mystery. Even fall's fame and popularity cannot hold the spotlight; the uniqueness of the leaf makes it stand out. When you walk among the others, hold on to your character. There's no reason for you to blend. Your shape and your colors will make you alluring. You'll stand out from the rest.